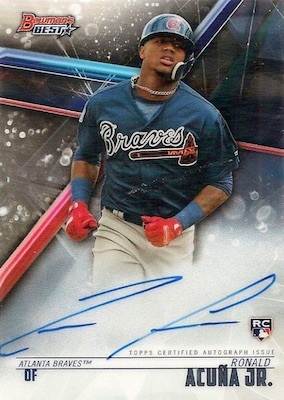 2018 Bowman's Best Baseball puts its own unique spin on MLB veteran, rookie and prospect collecting. The Hobby-only release promises four autographs per master box. Just as with the 2017 set, the 2018 release offers two mini-boxes per master box, and a case-hit autograph alongside insert parallels. 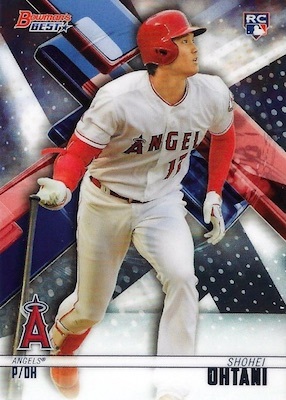 Putting an abstract background with a player image, the base set for 2018 Bowman's Best Baseball includes top current players and prospects. 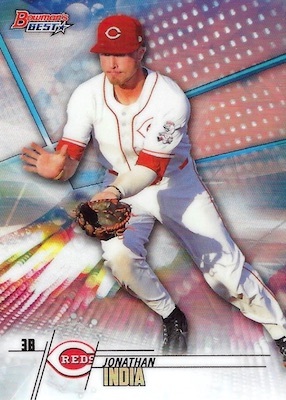 Although the prospect cards feature a different design, there are generally lumped in with the base cards. In addition, they all share the same Refractor parallels, including base Refractor, Atomic (1 per master box), Purple (#/250), Blue (#/150), Green (#/99), Gold (#/50), Orange (#/25), Red (#/10), and SuperFractor (1/1). Adding to that, the insert choices in the 2018 Bowman's Best Baseball checklist get a refresh. 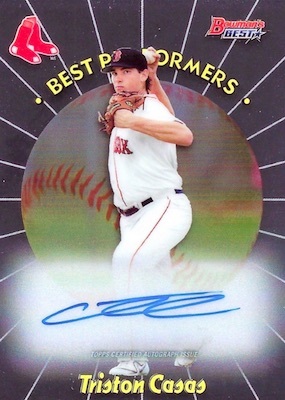 The retro-inspired 1998 Best Performers line is for past and present standouts, while Early Indications highlights more recent minor league success stories. Power Producers covers the big hitters, and Neophyte Sensations is only for the 2018 MLB rookies. All inserts feature case-hit Atomic Refractor parallels, plus numbered Gold Refractor and SuperFractor (1/1) versions. With four on-card signatures per master box, it should not be a shock that the 2018 Bowman's Best Baseball autographs take center focus. Best of 2018 acts as the main signed set, bringing with it base Refractor, plus Green (#/99), Gold (#/50), Atomic (#/25), and Red (#/10) Refractor parallels. 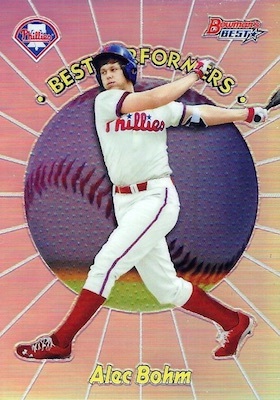 There are also the one-of-one SuperFractor and Printing Plate options. Each insert line noted above offers a limited signed version, as well, with the serial numbered 1998 Best Performers Autographs and Early Indications Autographs also having Gold Refractor (#/50), Atomic Refractor (#/25) and SuperFractor (1/1) parallels. Another new choice is the hard-signed Dual Autographs set with only 25 copies. For those chasing extreme rarity, these come in Atomic Refractor (#/10) and SuperFractor (1/1) parallels. Buy 2018 Bowman's Best boxes from Topps for $119.99. 99 cards, including 29 Top Prospects. REFRACTOR PARALLELS: Refractor, Atomic (1 per Master box), Purple #/250, Blue #/150, Green #/99, Gold #/50, Orange #/25, Red #/10, SuperFractor 1/1. 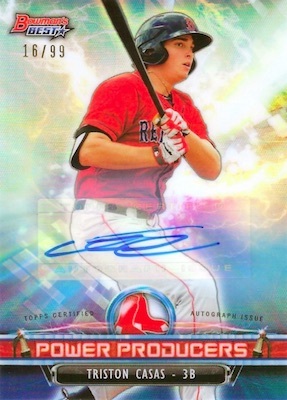 Buy 2018 Bowman's Best autographs on eBay. REFRACTOR PARALLELS: Refractor, Green #/99, Gold #/50, Atomic #/25, Red #/10, SuperFractor 1/1, Printing Plates 1/1. 35 cards. Serial numbered. 1 per case. REFRACTOR PARALLELS: Gold #/50, Atomic #/25, SuperFractor 1/1. REFRACTOR PARALLELS: Atomic #/10, SuperFractor 1/1. REFRACTOR PARALLELS: Atomic (2 per case), Gold #/50, SuperFractor 1/1. REFRACTOR PARALLELS: Atomic, Gold #/50, SuperFractor 1/1. REFRACTOR PARALLELS: Atomic (1 per case), Gold #/50, SuperFractor 1/1. 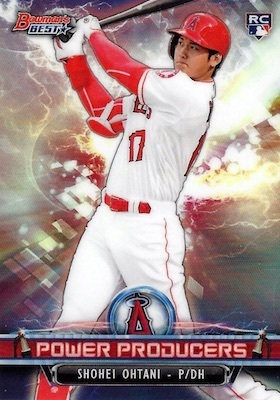 View the 2018 Bowman's Best Baseball checklist spreadsheet. Looking forward to this, 2017 had great value. Trey, has there been news on topps fire? Was just told this was pushed back again until after Christmas. Any truth to that? Wouldn’t be surprised, it’s been that way with ever product. Just built the set. Looks like there’s no TP-28. Casas is actually TP-29 and Mize is TP-30. Opened five boxes. 4 autos per box continue to make them a fun break. 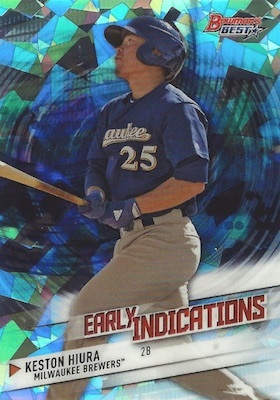 I did notice that the price point started 20-25% higher from last year and the numbered parallels and bigger hits feel a bit stingier. 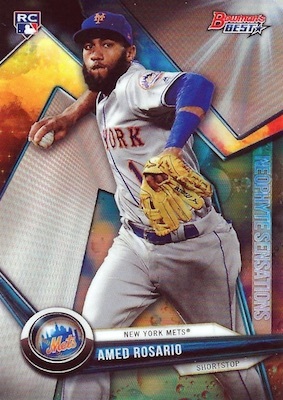 Jon…pretty standard for Topps throughout 2018….but the demand keeps getting higher, so there’s no end in sight until demand goes down. Anyway, I really like this product this year, much better design than in the past two years. Good names, on-card autos, etc. This stuff is jam packed with hot hits. It’s nice to see a product have so many low print. The on card autos are very nice and the refractors are sick. I have not collected much Baseball in the past 5 years or so but Bowmans Best has me back at it. At least until contenders football releases. Great product. Who was slotted for TP-28? Can the people who put this together make such obvious numbering mistakes over and over and over? It’s chromium technology. Same as Finest and Chrome.